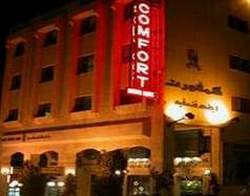 The Comfort Hotel Suites is located in the heart of Sweifiyeh, the commercial and shopping district in Amman. This unique location makes you within easy Walking distance of Shopping Malls, Restaurants, Banks, Supermarkets and Public Transportation. .
Comfot Hotel suites are all luxuriously furnished to your comfort. All suites are centrally air-conditioned. Each suite is furnished with a colored TV, direct dial phone, personal safety deposit box, mini-bar, microwave, oven,cooking utensils and a hair dryer. One large bedroom, living room, dining room, kitchenette & a private bathroom (60m2). Two bedrooms, living & dining room, kitchen & a private bathroom(60m2). One bedroom, living & dining room, kitchenette & a private bathroom (40m2). All open one bedroom, living & dining room, kitchenette and a private bathroom (40m2). Guests may use our Business Center (complete with e-mail, fax, copying and internet access) and our Health Club (complete with in door swimming pool, sauna, jaquzi etc). Dining in, our Rover’s Return English pub is an experience by itself. All Day Free Parking . TV. Satellite and In - House Movies . Transport From & to Airport.